Looking at the SMC Pentax-DA* 55mm F1.4 SDM, the Samyang/Rokinon 50mm F1.4 AS IF UMC and the HD Pentax-D FA* 50mm F1.4 SDM AW shows just how good modern lenses have become. The DA* lens is the oddball in this list. Older than the other two, officially designed for APS-C sensors and with a slightly longer focal length, the 55mm is still a capable full frame normal lens. It has the smallest and lightest body of the three, by a fair margin, making it easier to use for longer periods. The Rokinon is a more recent product, made by a manufacturer with a good reputation. Lacking autofocus and weather sealing, this 50mm still offers auto-exposure and even has an aperture ring, a rarity nowadays. 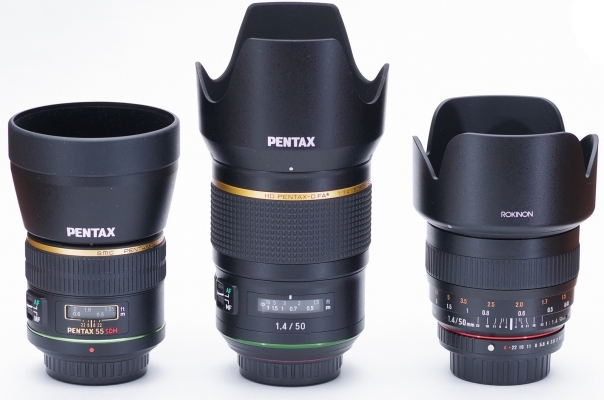 The D FA* lens is presented as the new star of the Pentax show. Larger, heavier, it's supposed to pack the best optical quality and best optical performances that money can by on the K-mount. While all three tested lenses are well designed and assembled, the build quality of the D FA* does stand out from the rest. Autofocus certainly is significantly better on the D FA*. It is much more responsive in all conditions. That being said, the DA isn't quite the slouch some have said it is. On APS-C, all three lenses produced excellent resolution figures in the center of the frame, the DA* and Rokinon being mostly similar, and the D FA* a full stop better. On edges and corners the D FA* has an even stronger advantage, and the Rokinon's resolution decreases at the smallest apertures. On full frame in the center, the three lenses are excellent at medium apertures, but the D FA* again takes the lead at wider values. The Rokinon is slightly better than the DA*. Corners really set the D FA* apart: while the other two lenses are completely blurry, the D FA* is perfectly usable wide open. The DA* reaches its limit, never attaining the resolution of the other two lenses in the corners. Vignetting is another area where the D FA* outperforms the other two lenses. On full frame the DA* shows strong vignetting wide open, with the Rokinon in-between. On the other hand, all three lenses deliver comparable results for bokeh, and all three are excellent performers. The Rokinon takes the laurels for starbursts, while the two Pentax lenses do not produce particularly impressive results in this regard. Chromatic aberration, again, shows the D FA* taking the lead, with the Rokinon second and the DA* trailing. Flare is present to some extent for all three lenses, being worse for the DA* and the Rokinon. On the other hand, the Rokinon is worse for distortion, with a field-noticeable 1.8%, followed by the DA* at 1,1%. The D FA* shows what might be the lowest value ever measured on a K-mount lens, at 0.15%. The takeaway is that all three tested lenses offer top-tier performances. The Rokinon and DA* balance their respective perks and flaws. The D FA* stands on a league of its own, consistently better than the other two for all tested parameters. It really is the crown jewel of the Pentax line-up. The DA* 55mm F1.4 currently sells for $546.95, a good value when compared to its competitors. The Rokinon 50mm F1.4 can be bought for $399, an excellent deal if one doesn't require AF. The D FA* 50mm F1.4 sells, as of February 2019, for $996.65. The comparison between our three tested lenses shows just how far optical design has come in recent years. All three lenses are mostly excellent. The DA* 55mm is hindered by its poorer optical performances in the corners, and by its APS-C pedigree, which limits automated image corrections when used on full frame. It is still a lens worthy of interest. Its small size makes it easy to carry almost anywhere. The Rokinon also is a worthy contender, held back by the lack of autofocus and good, but not always great, results in our optical tests. The D FA* 50mm F1.4 is almost twice as expensive as its DA* counterpart. Is it three times as good? Hard to say, but it is certainly worthy of being considered the flagship lens of the K mount in 2019. This is a lens with no real optical flaws. Apart from its large size, it is hard to find any fault with it. Be sure to check the user reviews of the SMC Pentax-DA* 55mm F1.4 SDM, the Samyang/Rokinon 50mm F1.4 AS IF UMC and the HD Pentax-D FA* 50mm F1.4 SDM AW or post your own if you already own these lenses.